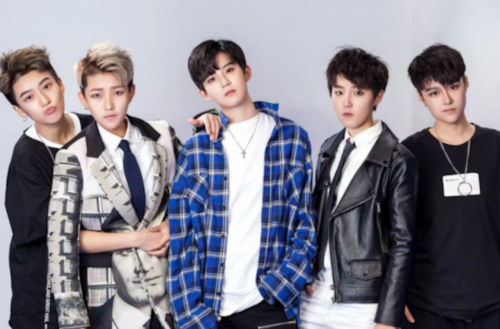 There’s something special about the wildly popular Chinese boy band FFC-Acrush: None of its members are boys. Female fans call the band members “husbands,” a common expression girls use to describe their favorite male pop idols. The A in Acrush stands for Adonis, the mythical embodiment of youthful male beauty worshipped by women in Ancient Greece. RELATED | Lesbians Who Look Like Justin BieberSHOP Quartet! The size and ferocity of their fandom is pretty amazing considering the group hasn’t actually released a music video yet. Chinese tech juggernaut Tencent showed the group off at their recent Husband Exhibition pop star showcase. Like many boy bands, FFC-Crush was put together by a company. In this case, it’s Zhejiang Huati Culture Communication Co. Ltd., an entertainment company started by Tencent. The group’s members were recruited from across China.